The new building serves as a “Living Lab” featuring Saint-Gobain’s vast product offerings, including: roofing, glazing, insulation, gypsum wallboard, ceilings and wall panels. As the largest building manufacturer in the world, Saint-Gobain CertainTeed is dedicated to high performance sustainable materials that transform the built environment. Saint-Gobain CertainTeed’s previous headquarters was located in Valley Forge, Pennsylvania. The building was outdated and it did not communicate the vision for their forward thinking company. They chose to relocate their North American Headquarters to an abandoned brownfield that underwent a major renovation. The goal was to create a “Living Lab” showcasing their cutting edge products. Another main focus was to provide a high quality working environment for staff that encourages productivity, collaboration and connection to the outdoors. To align the building goals with the corporate sustainability mission, the facility recently achieved double LEED Platinum certification, the highest standard in sustainable design. Bernardon led the core and shell team, which achieved LEED Platinum under the LEED 2009 for Core & Shell Development Rating System in July 2016. The interior fit-out was completed by Jacobs and it achieved LEED Platinum under the LEED 2009 for Commercial Interiors Rating System in May 2016. The Sheward Partnership managed the LEED certification process for the core and shell, and we partnered with the Construction Manager to complete construction-related LEED credits under the interior fit-out. LEED certification was a priority from the project onset. During schematic design, The Sheward Partnership led a sustainable design charrette with base building and interior fit-out consultants. The team developed a schematic energy model and a long list of potential energy upgrades. The energy modeler input each energy conservation method, and examined impacts on annual energy cost and ENERGY STAR score. At the same time, the Construction Manager evaluated cost impacts so we could maximize energy savings within budget. Through this iterative process, the team established a design that met Saint-Gobain’s rigorous energy efficiency goals through their internal CARE:4 corporate sustainability program and achieved LEED points. While the initial goal was LEED Gold, Saint-Gobain CertainTeed made the commitment to pursue the highest standard of LEED Platinum for both certifications. Dating back to the 1960s, the existing site was comprised of two existing office buildings designed by Vincent Kling. The site featured a stunning landscape with rolling hills, mature trees, and a stream running under the building with a small pond. The existing buildings were demolished to the structural system and the steel was reused in the renovation. Also, a 40,000 square foot addition was added to connect the two buildings. Asbestos was remediated on-site to make the site once again a safe place to build. The existing buildings dated back to the 1960s. The existing envelope featured innovative shading devices, but the single pane glazing was extremely inefficient. Photos courtesy of Bernardon. The existing pond was overrun with invasive species. Part of the renovation effort involved replanting the periphery of the pond to promote water quality. Also, a comprehensive stormwater management plan was implemented on-site to infiltrate stormwater and reduce run-off that may pollute local waterways. 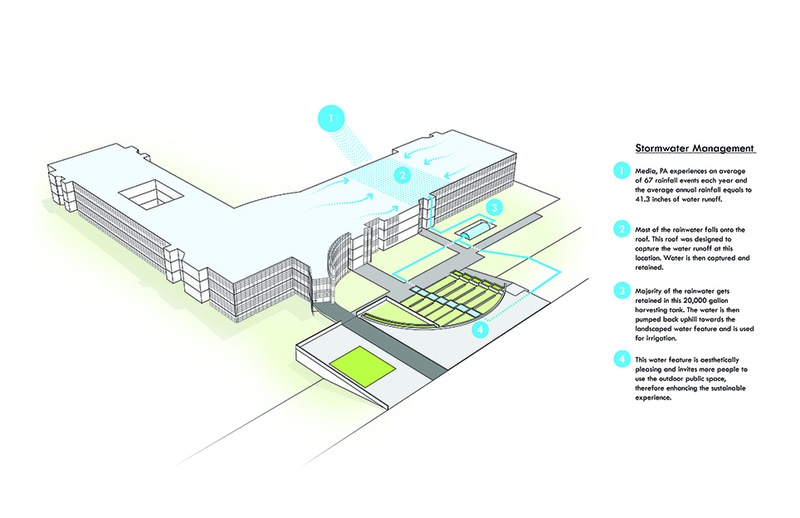 The building features an innovative rainwater harvesting system for irrigation and to supply the water feature. Select planting beds near the main entrance are equipped with irrigation, but a majority of the site is not irrigated. Water is collected from a 7,000 square foot area of the roof and then directed to a 25,000 gallon cistern. This strategy reduces stormwater run-off and eliminates outdoor potable water use. The building features Saint-Gobain’s innovative Sage Glass, an electrochromic glass that automatically tints according to incoming daylight. Sage Glass was installed along the southern and western facades where there was little or no tree coverage. Sensors are located on the outside of the building to measure daylight levels and tint the glass accordingly. This system greatly improves energy performance and thermal comfort by blocking uncomfortable heat gain. At the same time, the system maintains views to the exterior without the need for continuously opening and closing window shades. Other energy efficiency improvements of the envelope include improved insulation in walls and roofing and high efficiency glazing and framing systems. LED lighting is installed throughout the interior and exterior. Interior lighting in perimeter spaces is equipped with daylight harvesting controls and programmed in tandem with the Sage Glass to dim interior lighting according to daylight levels. Additionally, Saint-Gobain CertainTeed has a corporate sustainability policy to purchase ENERGY STAR labeled computer equipment and appliances to reduce electricity use associated with plug loads. Lastly, the building features a 20 kW solar array on the roof to promote renewable energy systems and reduce greenhouse gas emissions. 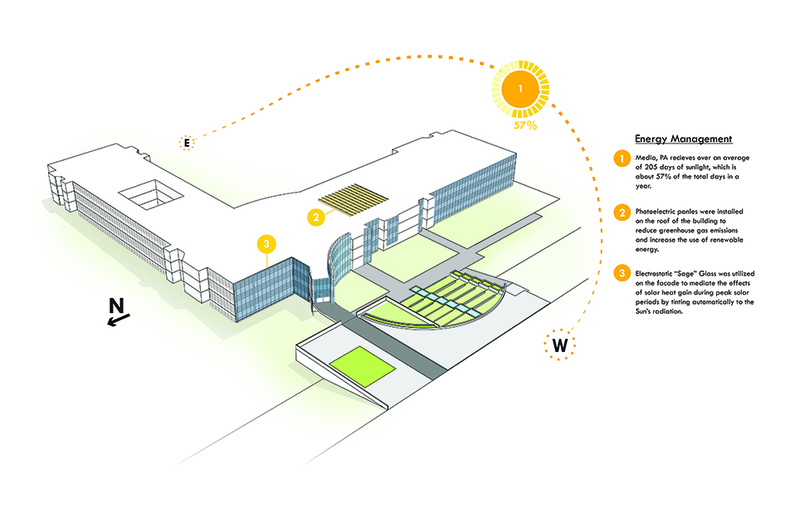 In total, the building anticipates 30% energy cost savings. During design development, the building achieved Designed to Earn the ENERGY STAR certification. Saint-Gobain is an ENERGY STAR Partner and they made the commitment to measure and verify ongoing energy performance. Saint-Gobain CertainTeed’s internal team is actively tracking energy and water use through ENERGY STAR Portfolio Manager. The LEED Energy Modeler will evaluate the first 12 months of energy data to calibrate the results and make additional improvements. At the time of initial planning, LEED version 4 was still in early development. Saint-Gobain CertainTeed chose to pursue LEED v4 Pilot Credits as Innovation Points to demonstrate how their products contribute to the latest LEED updates. Saint-Gobain CertainTeed promotes material transparency through Environmental Product Declarations (EPDs) and Health Product Declarations (HPDs). This flagship double LEED Platinum project leads by example in the greater Philadelphia region and beyond. Moving forward, Saint-Gobain CertainTeed is investigating sustainable operations and maintenance practices to maximize environmental impacts for the life of the building. LEED Commissioning Agent: Alderson Engineering, Inc.